A.J. Sparks of Fort Lewis College drives to the basket against Regis University on Saturday night at FLC. Sparks had nine points and five assists in 20 minutes. 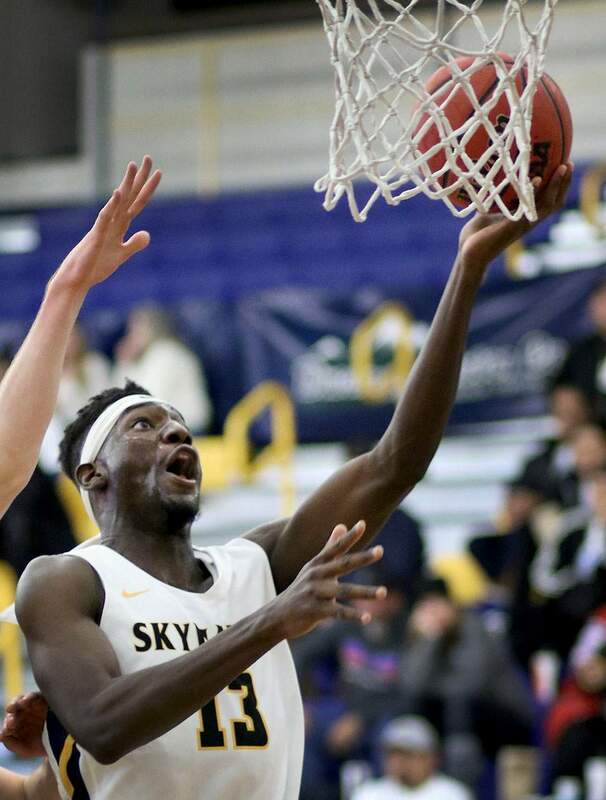 Otas Iyekekpolar of Fort Lewis College lays up a shot against Regis University on Saturday night at FLC. He had nine points and seven rebounds. 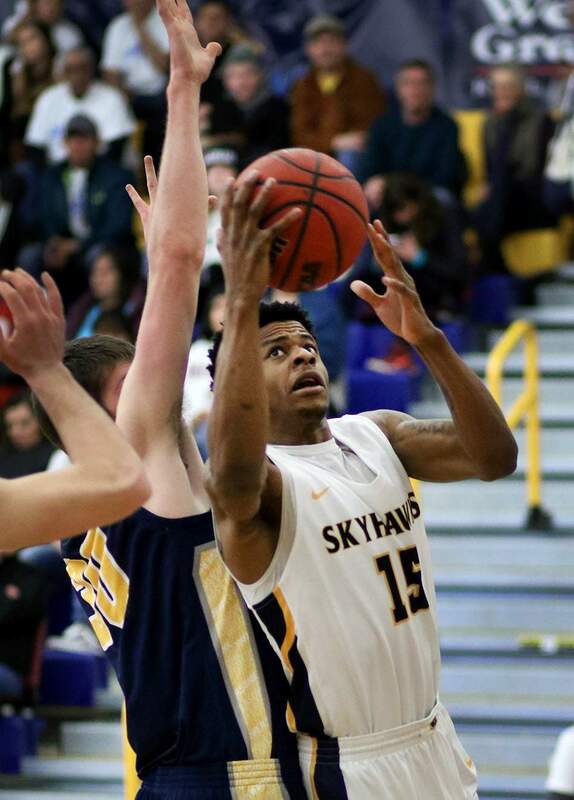 Kireed Johnson of Fort Lewis College puts up a 3-point shot against Regis University on Saturday night at FLC. Johnson finished with 10 points. Brendan La Rose of Fort Lewis College goes up for a rebound over Regis University on Saturday night at FLC. 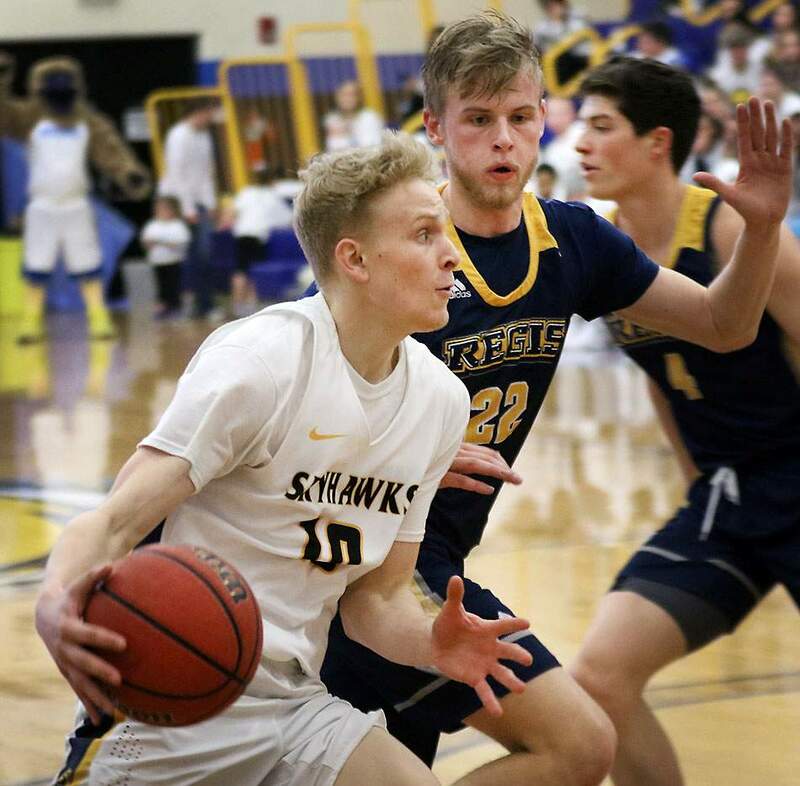 Will Wittman of Fort Lewis College drives around a Regis University player on Saturday night at FLC. Otas Iyekekpolor looks to score against Regis. 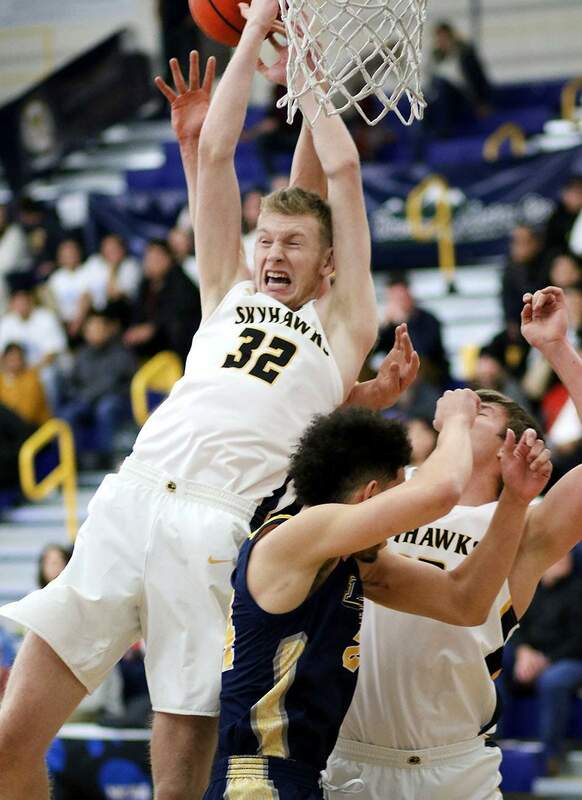 Regis made 10 shots from behind the 3-point line in the final 15 minutes, 41 seconds of play Saturday night, and the hot shooting sank the host Skyhawks. 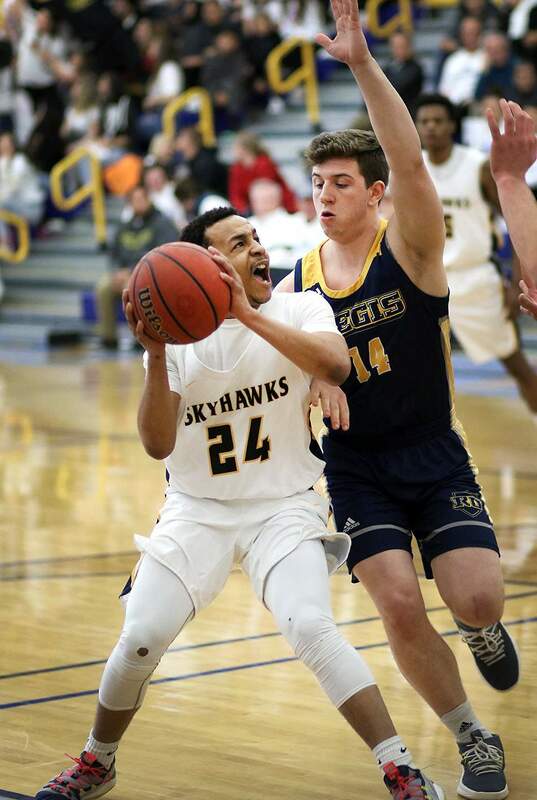 In a rematch of last year’s Rocky Mountain Athletic Conference tournament championship game in the same Whalen Gymnasium, Regis again came out on top of the Fort Lewis College men’s basketball team. This year, FLC hasn’t been close to contending for a conference title in an adversity filled season. Meanwhile, Regis once against has RMAC and regional tournament hopes at stake and came into Saturday’s game angry after a 77-70 loss to Adams State a night before. While the Skyhawks (10-13, 5-12 RMAC) kept the game close for much of the night, they simply didn’t have the firepower to match Regis (16-7, 13-4 RMAC), which answered every big FLC bucket with one of its own in a 86-70 victory. 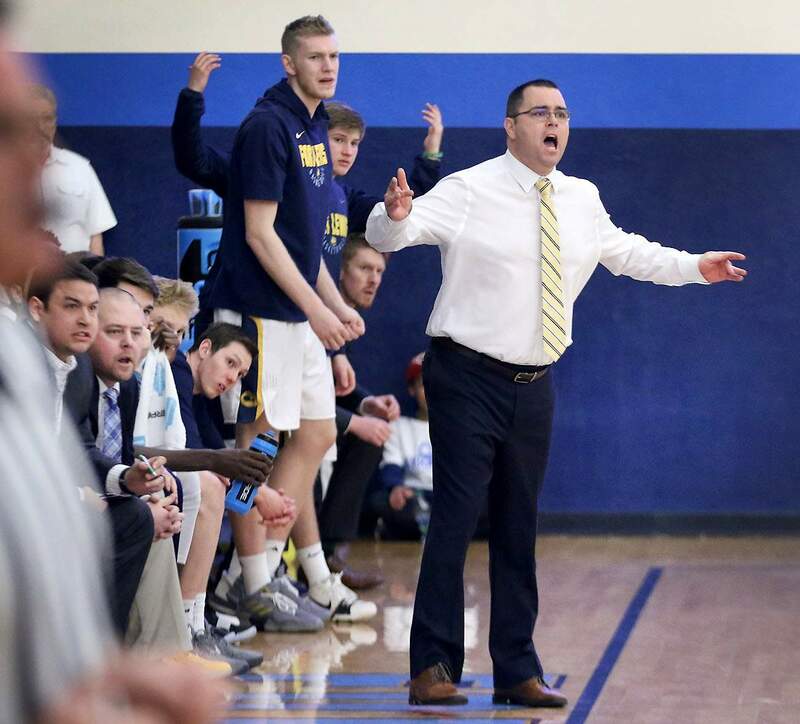 Fort Lewis College head coach Bob Pietrack and his bench react to a foul during the Regis University game on Saturday night at FLC. Jarrett Brodbeck led Regis with 17 points on 5-of-11 shooting, including 4-of-8 from 3. He made two big 3s in the final 10 minutes to help put the game away. Christian Little and Roberto Vercellino combined to go 5-of-5 from 3, two shooters who FLC wasn’t overly worried about making long-range shots. As a team, the Rangers finished 14-of-29 from 3 to FLC’s 6-of-25. FLC had to fight back all night and never held a lead in the game. After going down 11-6 early, the Skyhawks tied the game at 17. But a cold stretch without a point for 5:42 of play saw the chance to take a lead slip away, and FLC was down 32-26 at halftime. With 14:50 to play, the Skyhawks were within 39-37 of Regis. Little made one of his three 3s followed by two Vercellino 3s and another from Tomas Auruskevicius, and the FLC deficit was 67-51 with 6:45 remaining. Little finished with 15 points and six rebounds. Auruskevicius had 13 points, while Toni Rocak had 11 points and Brian Dawson finished with 10 points and seven assists. FLC was led by Marquel Beasley’s 15 points. Alex Semadeni had 14 points and seven rebounds. Kireed Johnson finished with 10 points. A.J. Sparks had another strong game in limited minutes with nine points and five assists, but FLC’s lack of depth at point guard once again showed. 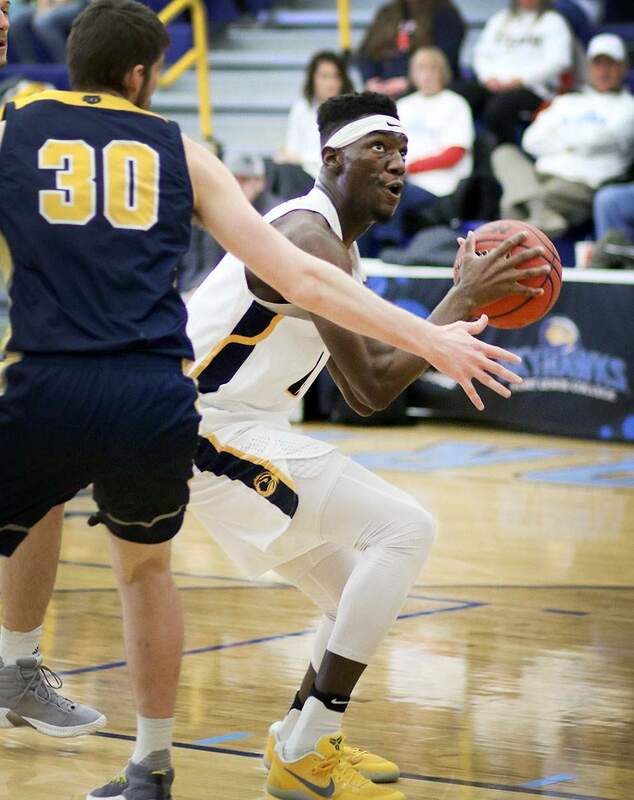 Marquel Beasley of Fort Lewis College drives around a defender as he lays up a shot against Regis University on Saturday night at FLC. Beasley led FLC in scoring with 15 points. Otas Iyekekpolor had nine points and seven rebounds for FLC. Redshirt freshman forward Brenden Boatwright finished with seven points on 2-of-2 shooting and 3-of-5 at the foul line one night after he had 28 points on 9-of-9 shooting and 10-of-11 free throws for the Skyhawks in a win against Colorado Christian. Regis is four games back of Colorado School of Mines (20-3, 17-0 RMAC) in the RMAC standings and one game ahead of Black Hills State for the second seed and will look to make a consecutive appearance in the NCAA Division II South Central regional tournament. FLC has five games to play with three at home and will aim to build momentum going into a big offseason of rebuilding.